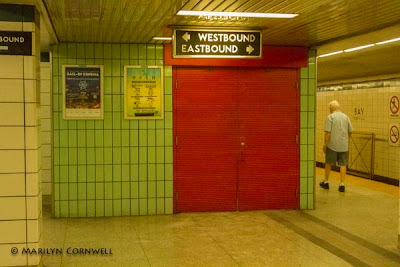 I was in Toronto last week and was at the Bay subway station at the west end where the double red doors are. 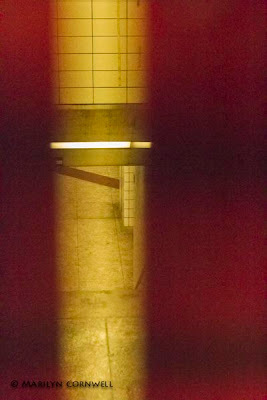 There's a small space between the doors and one can see there's a staircase and platform beyond. This is one of Toronto's abandoned subway stations, a most curious and tantalizing circumstance. Lower Bay station is far better known to Torontonians, as it is a station that actually saw passengers for the early part of its existence before being abandoned. When the Bloor-Danforth subway was built, the plan was to interline it with Yonge and University. A connection to the west of St. George Station was easily accomplished, and to complete the wye, tracks were built northeast from a junction just north of Museum Station to a station beneath Bay Station on the Bloor Line, before linking up with the Bloor tracks just west of Yonge Station.